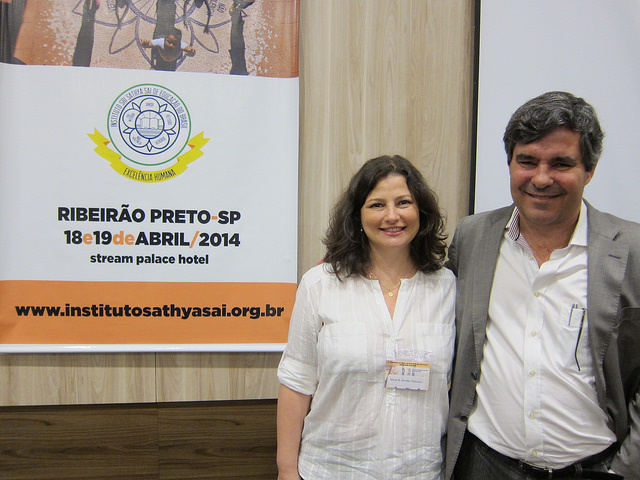 This weekend Maria and I had the very great pleasure and honour to be speaking at the 10th National Sri Sathya Sai Congress on Education in Human Values in Ribeirão Preto, Brazil. The congress is organised by Instituto Sri Sathya Sai de Educação do Brasil (The Institute of Sri Sathya Sai Education of Brazil). The institute is a not-for-proft organisation with the mission of implementing the Sathya Sai Education in Human Values (SSEHV) programme in Brazil. 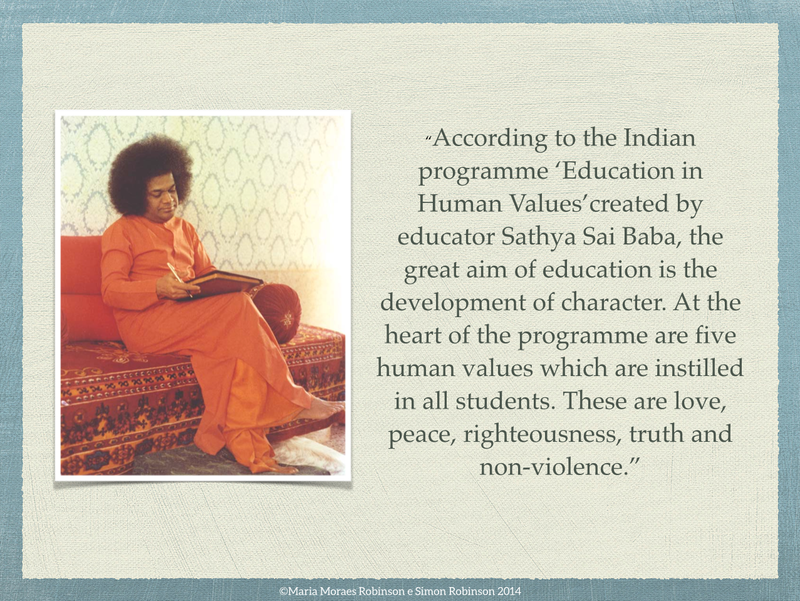 This educational programme was developed in India in the 1960s, and has at its heart not only the mission of providing the highest quality of education in children, but also the development of their character, the foundation of which is the teaching of the five universal human values of Truth, Righteousness, Peace, Love and Non-Violence. 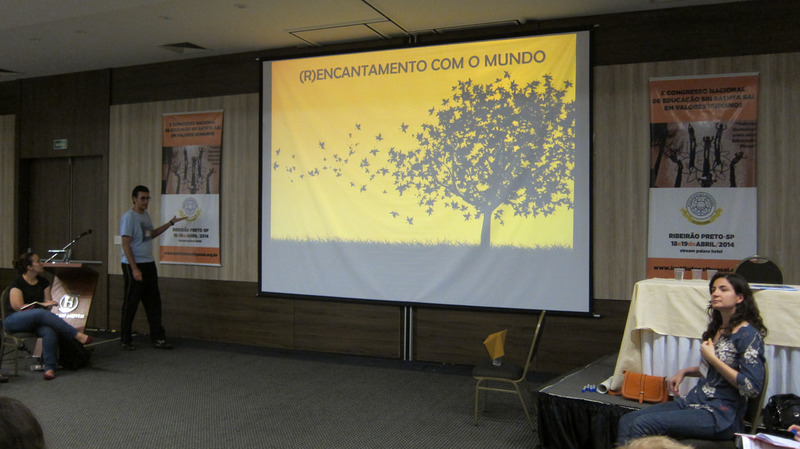 Maria and I had been invited to speak by Rodrigo Bicalho, the president of institute in Brazil. The reason was that in our book Holonomics: Business Where People and Planet Matter we write about the educational programme in human values, and how it is of equal relevance in the teaching of adults, including business executives and MBA and other post-graduate students. In 2010 Maria enrolled for the advanced course in Education and Human Values, and while studying she realised that many of the teachings could be put into practice for business executives. 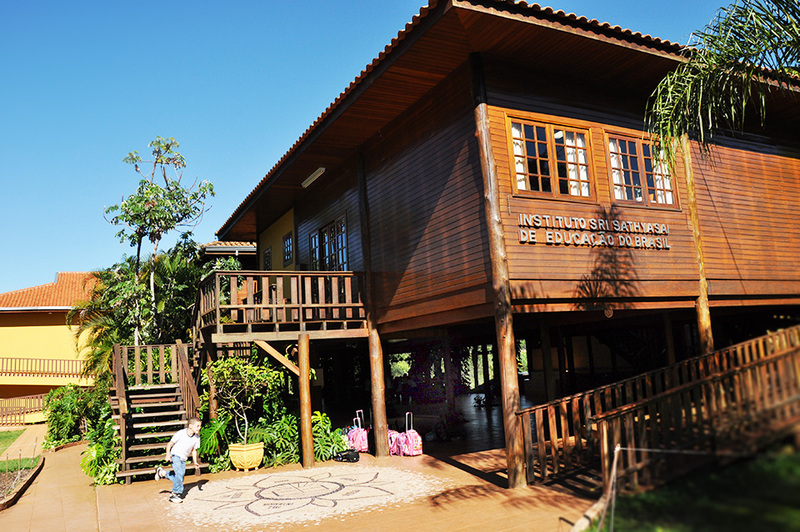 The city of Ribeirão Preto was chosen as it is home to both one of the five Sri Sathy Sai schools in Brazil, and also home to the institute, which was founded in 2000. After opening speeches from Rodrigo and the mayor of Ribeirão Preto, Dr. Dalton de Souza Amorim, the national coordinator of education in the Sai Organisation spoke about human values in education. “Education is an internal fight for transformation” he told us, and “values represent riches, the most valuable things in our lives”. He made an excellent observation that in schools, the staff room has to have the same energy and be as full of human values as the classroom. In Brazil, this programme is helping many disadvantaged children, many who suffer from violence, poverty and drugs. “Sathya Sai schools have an obligation to show what is possible” he told us. The schools also support parents. Dalton told us a story of one parent who came to an open evening. Teachers should not be imposing the human values on parents, many who are struggling as much as their children. This one parent told the teachers and parents that she had been adopted, and had never been told she was loved by her mother and never received a hug. The schools provide a very supportive environment for parents, and as Daltion noted “this life is complicated and no one has an easy recipe as an answer”. In another pertinent anecdote, Dalton told us of another child who asked why he should learn Portuguese grammar, when he was needed at home to help his brother in drug dealing. The teacher answered that “you have to learn at school in order to be able to discern good from bad”. Quite rightly, Dalton pointed out that there were many courageous teachers, and that human values really act in our day-today, when things are not always going so well for us. Pedro Hartung – How can Suri, aged five, be the world’s 21st best dressed woman? 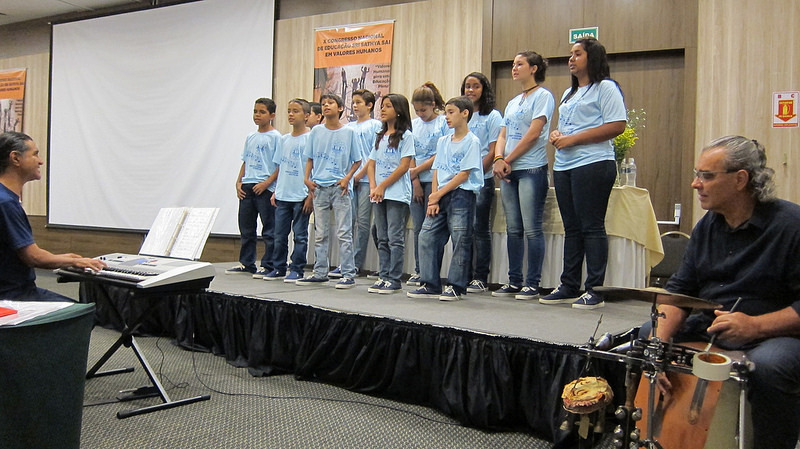 Following some wonderful singing from the choir at the Sri School in Ribeirão Preto, Pedro Hartung from Instituto Alana gave an emotional talk about child consumerism and values. As you will have seen from previous posts, I am extremely interested in the concept of conscious consumption and also what I call ‘holonomic brand values’ and I took many notes from this talk. 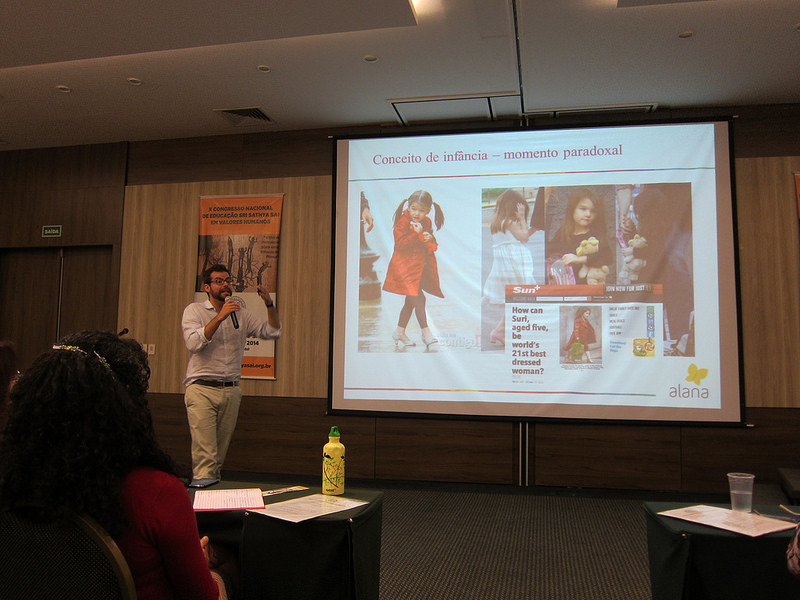 I have written a separate article about Pedro’s presentation, as it deserves space to discuss these important issues (see Hyper-consumption in infancy and the defence of children and childhood). In the afternoon we all split up to take part in a number of workshops, and Maria and I chose to attend the workshop on Environmental Education and Education in Human Values run by Gustavo Barros Alcantara and Anayra Giacomelli Lamas Alcantara who are both teachers at the Sai School in Ribeirão Preto. These workshops ran for the whole afternoon, and therefore gave us a lot of space to dive into issues which are deeply affecting us. In our workshop, we watched the song Year of the Rat by Badly Drawn Boy, which if you have not seen it, can be watched above. It really helped inspire our discussion about human values, not just peace but also non-violence too, and how without human values, we can not be sustainable in our lives. The next morning we heard from a number of the teachers at the Sai School in Ribeirão Preto, including one of the students and a couple of parents. The school was founded in 2002 and currently has 225 pupils. Unfortunately Maria and I had to return to São Paulo earlier than we had expected, and were therefore unable to attend the trip to the school to find our more. Maria and I will definitely return to Ribeirão Preto in the future to visit the school, and spend more time with the teachers and staff, as it really is an extremely special school, doing amazing work in all aspects of the lives of students. Following this presentation, Maria and I spoke about the journey into adulthood and the teaching of human values. 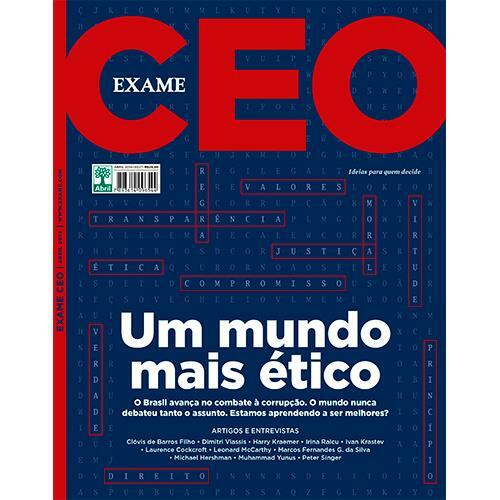 While at the airport waiting for our flight to Ribeirão Preto, we saw that in the April edition of Exame CEO, the entire edition was dedicated to ethics. In our talk we read out a brief quote from one of the articles which said that according to research, seven in ten Brazilians would stop buying products or services from companies who were involved in irregularities. It is really encouraging to see magazines such as Exame CEO give so much space to the theme of ethics, and shows just how important work such as ours is introducing ethics and human values into business and economics. Maria and I talked about many of the themes which those of you who read Transition Consciousness will already be aware of. We talked about our exercise in which we blindfold executives and ask them to work in clay, an exercise which Maria came across while on the course in Human Values in Education, and which had been introduced by Karla and Paulo, who also had attended the course and who were here at the congress. We talked about the four ways of knowing – thinking, feeling, sensing and intuition, we talked about the need for human values in brands, all these themes of which I discuss in my article From Economic Brand Value to Holonomic Brand Value. We had time to actually do one our meditation on starlings exercise, where we show people a film of the murmuration of starlings, and ask people which words come to their minds when they watch them (see my article Dialogue on Leadership: Maria’s Meditation on Starlings). People in the audience suggested many words, examples being dance, harmony, synchronisation, poetry, beauty, respect and co-ordination. As Maria said, when we do this exercise with executives we then ask “would you like your own organisation to exhibit these qualities” and of course the answer is universally yes. I am now starting to speak Portuguese at events, and so I took over from Maria to talk about “seeing”. It was interesting that the opening of the congress featured the phrase “The Look of the Educator” (O Olhar do Educador”) i.e. the way in which a teacher sees. 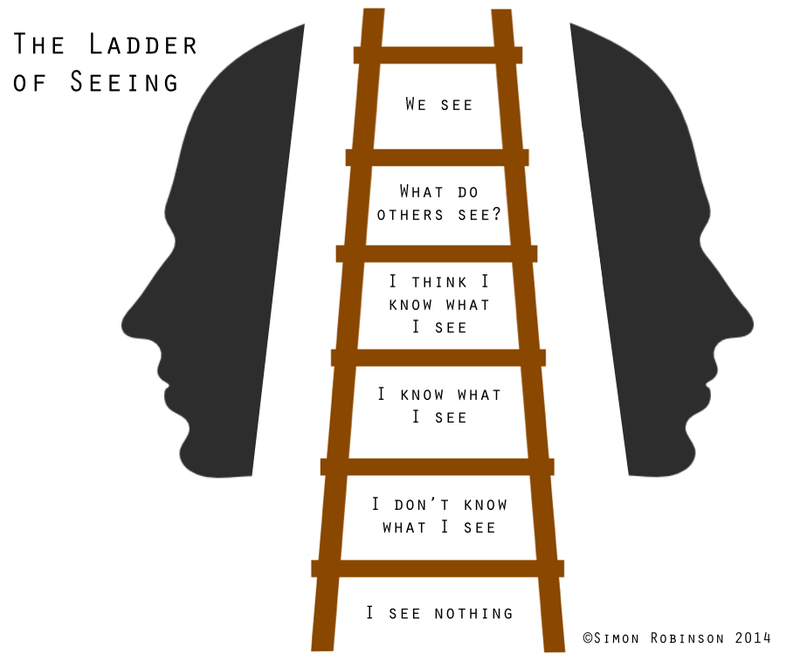 In holonomics we write that “to see well is an act of humility” and I explained this via our “ladder of seeing” which is a tool we created to help executives develop their level of consciousness, and hence their ability to “see”. As well as Exame CEO, we also discussed this month’s Brazilian edition of Harvard Business Review, which features a number of articles on sustainability, including our own article Holonomic Thinking. Our article is in Portuguese, and features our Ladder of Seeing and the Holonomic Operating System – the four ways of knowing. It really does seem to us that big businesses are now waking up to the need to understand reality in a qualitatively different manner in order to really understand complex problems in their entiretuy as well as to be able to develop and nurture truly authentic brands. The teaching of human values is critical in this journey of transformation, and programmes such as Sathya Sai have a huge role to play. We finished our presentation with Maria talking a little bit about the award ceremony Premio Crianca, which is sponsored by the Abrinq Foundation and Save the Children. 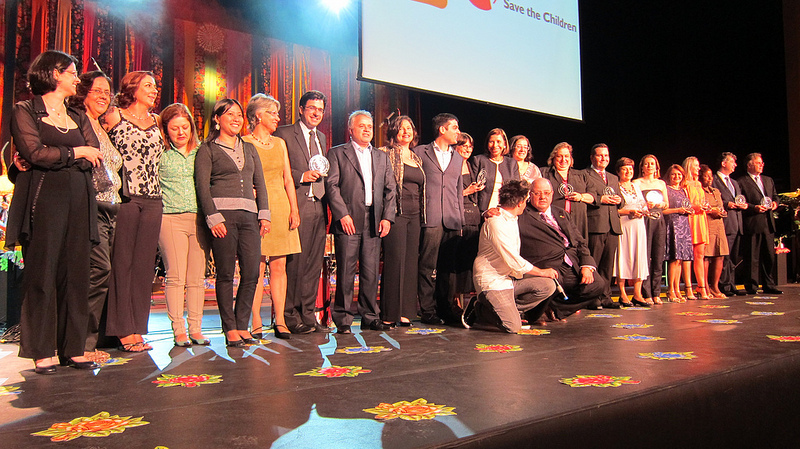 In 2012 Maria was one of the judges, and one of the winning projects was Estação da Luz, a Sathya Sai school in Eusébio, in the northern state of Ceara, and so it was particularly special to have two of the teachers from this school at the congress. (For clarity, Maria played no role in the evaluation of this particular project for the awards). The heart is the true source of education. As I said, both Maria and I would dearly have loved to have been able to stay for the remainder of the congress, with the second day being full of insightful and deeply inspirational talks. I certainly learnt a lot myself, and it was a very wonderful experience to spend this weekend with such amazing people doing remarkable work transforming the lives of both children and parents in Brazil. 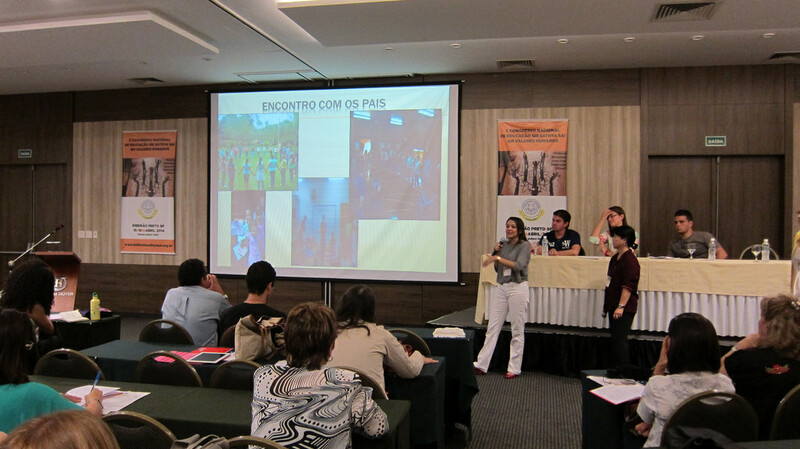 this is really good, Simon and Maria – thanks for sharing about the Sri School in Ribeirão Preto. I am glad to know they exist. Also, congrats on the HBR article – I will send it to my post-graduate programme on knowledge management. I believe it will be a great contribution to the course. abraço!